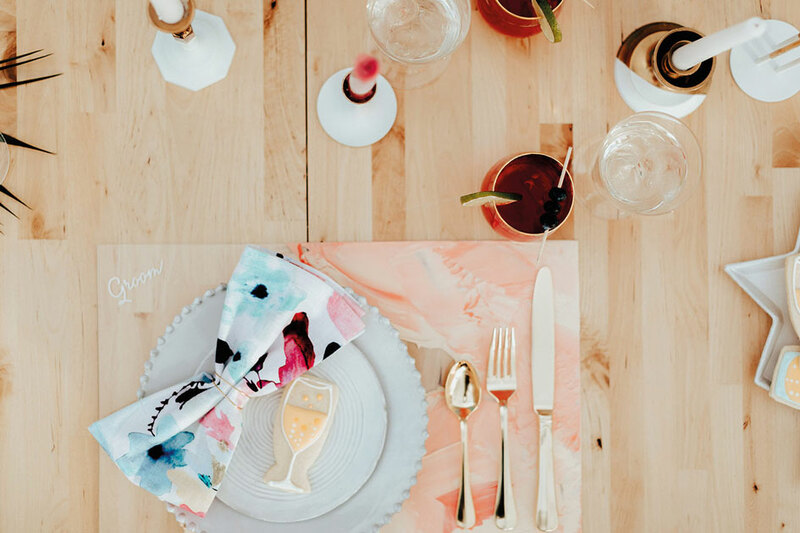 We did a double take when we first saw this bright and bubbly, edgy and urban reception dreamed up by the event planners at The Indigo Bride, based in Bend. 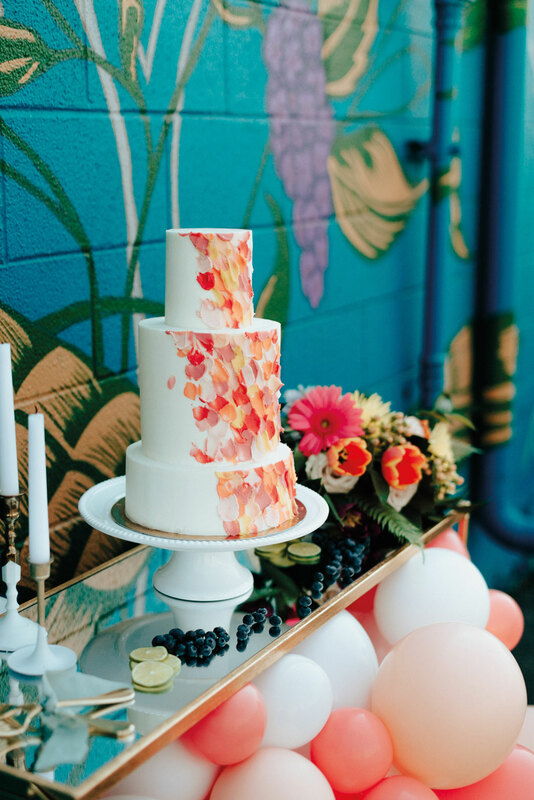 Inspired by the brilliantly colored floral mural painted on the side of local used bookstore The Open Book and replete with fun and irreverent details, this summery celebration looks like it floated over from Portland on a cloud of pink balloons. 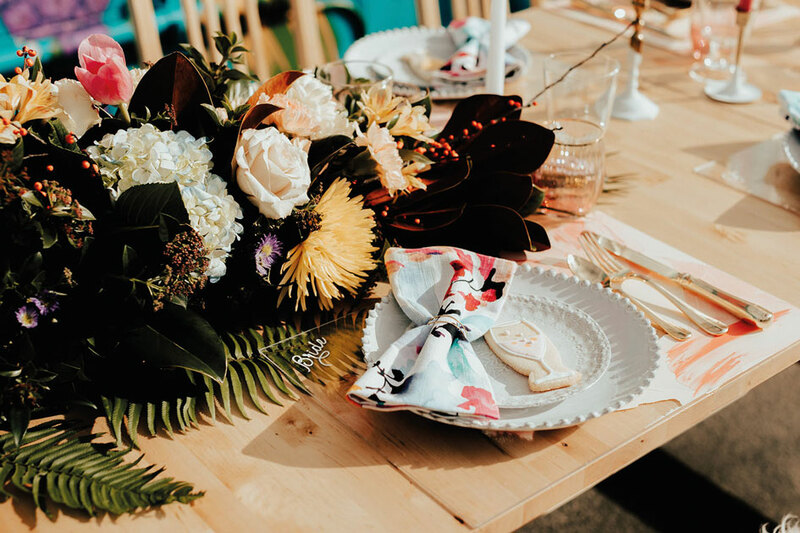 “Bend, Oregon has many rustic, bohemian weddings, and we wanted to show that the area can also be a place for bright, urban weddings,” says Bree Denman of The Indigo Bride. “We wanted to show new, creative ideas to help couples incorporate color and offbeat designs into their weddings. 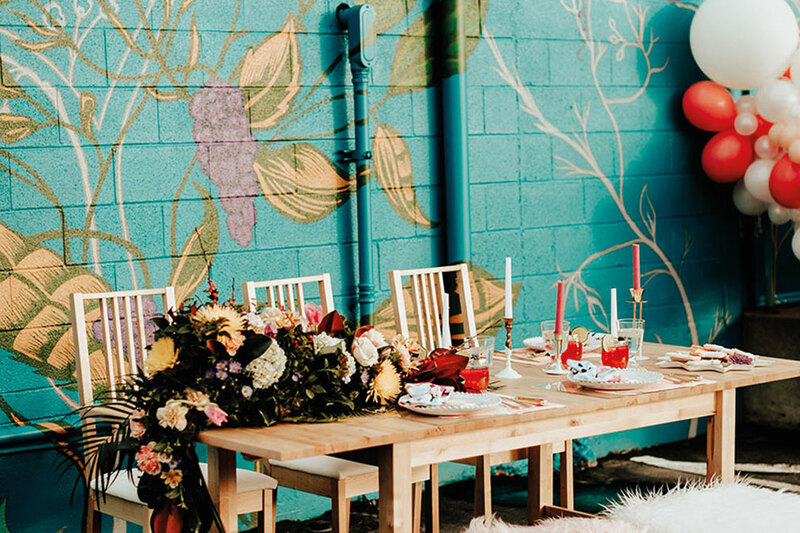 Our statement balloon installation combined with the vibrant mural backdrop created the perfect space for a modern and funky wedding celebration,” says planner Bree Denman. Here, we asked her to break down the elements that make up this fun and festive tableau. Bend-based Too Sweet Cakes Bakery created an elegant and whimsical three-tiered banana-flavored cake frosted in cream cheese buttercream and adorned with an abstract pattern that evokes rosy-hued balloons rising skyward. $9 per slice. “We do a lot of rustic, woodland-themed weddings, so it was inspiring to be part of something with a more urban feel,” says Tracy Curtis of Woodland Floral in Sisters. “We wanted to use different flowers than we usually work with to achieve the color scheme.” Her asymmetrical arrangements were designed to coordinate with the mural that served as a backdrop and included purple asters, light blue hydrangeas, ilex berries, cremones and tulips. Similar bouquets start at $200. 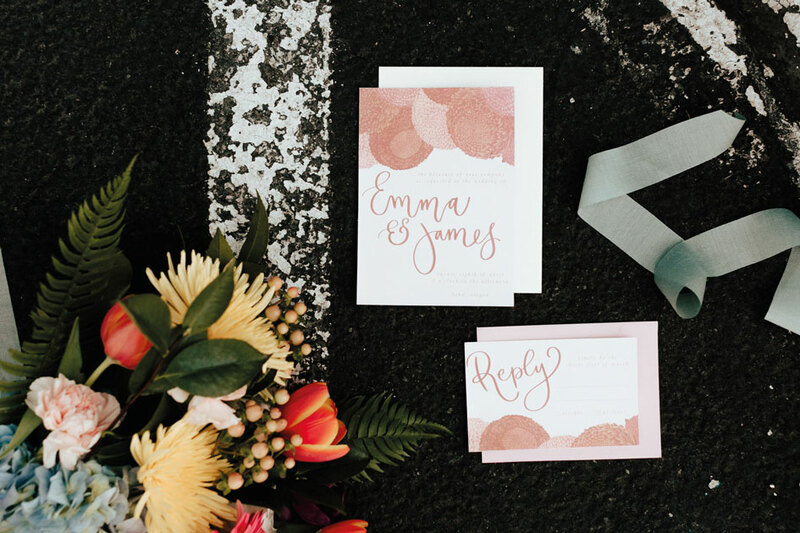 With floral illustrations that mirror the colors in the mural and call to mind the shapes of the balloon installation, together with sweeping, hand-lettered calligraphy elements, these whimsical invitations by Benson Paper Co. in Bend capture the feeling of being carried away. Custom invitation suites start at $250. When decor is bright and bold, opt for sleek and chic tableware, such as gold-tone cutlery by Juliska and textured plates by Astier de Villatte, available at Studio Vero in Bend. “Spirale” and “Marguerite” plates, $72 each. Gold-tone cutlery, $153/five-piece set. 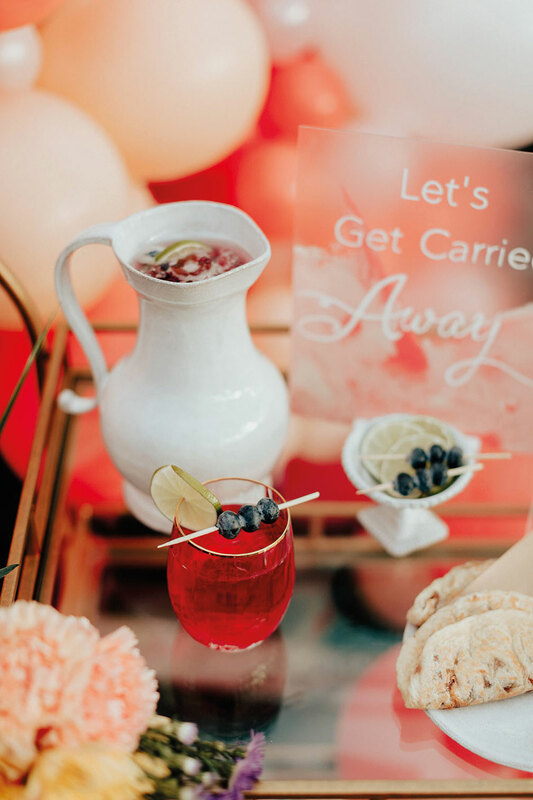 The Indigo Bride team created a vodka-based blueberry and hibiscus cocktail exclusively for Oregon Bride. Get the recipe at orbridemag.com. 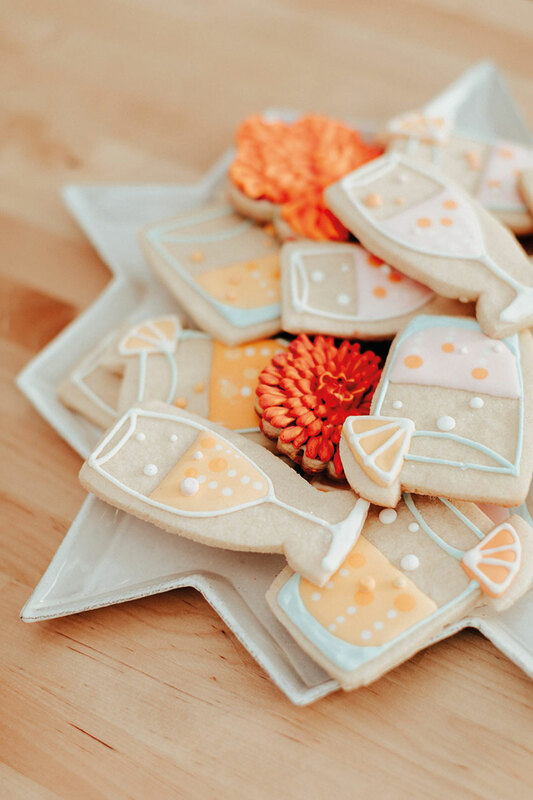 Rebekah Gerdes of Sage Confections in Bly, Oregon, loves the idea of sending guests home with a sweet treat, such as these clever champagne-glass sugar cookies featuring royal icing bubbles. Iced almond and vanilla sugar cookies start at $30/dozen.